Warner Music Group agreed to pay £487 million ($762.5 million) for key parts of EMI Music, the British record label group acquired last year by Vivendi SA's Universal Music Group. Under the deal announced Thursday, Warner Music will get the Parlophone Label Group, which comprises the namesake Parlophone label, along with the Chrysalis and Ensign labels. The deal represents a victory for Warner Music over competing bidders, including BMG Rights Management, a joint venture between Bertelsmann SE & Co. and Kohlberg Kravis Roberts. Warner, owned by Access Industries Inc., lost out to Universal in bidding to buy EMI from Citigroup Inc. After a lengthy and sometimes contentious regulatory review, Universal paid $1.9 billion for EMI's recorded music operations last year. To win European antitrust approval to buy EMI, Universal agreed to sell significant swaths of EMI's operations, mainly in Europe, where EMI has historically been strongest. Warner Music is the world's third-largest record company by market share, behind Universal and Sony Corp.'s Sony Music Entertainment. Parlophone is the European distributor for numerous major artists, past and present, including Air, Coldplay, Daft Punk, Danger Mouse, Deep Purple, Duran Duran, Edith Piaf, Gorillaz, Iron Maiden, Itzhak Perlman, Jethro Tull, Maria Callas, Pet Shop Boys, Pink Floyd, Radiohead and Tina Turner. Warner Music also will get EMI's recorded music operations in Belgium, Czech Republic, Denmark, France, Norway, Portugal, Spain, Slovakia and Sweden. Universal is to retain EMI's operations in Germany, plus the recordings and distribution rights to the Beatles catalog—perhaps EMI's best-known asset. 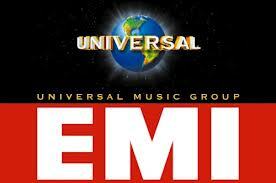 Universal also will retain EMI's U.S. labels, including Capitol Records and its catalog. Universal Music Chairman Lucian Grainge said in a statement: "We're satisfied that our agreement with Warner Music will provide a home for [Parlophone] artists." In a separate statement, Warner Music Chief Executive Stephen Cooper alluded to his company's own history as a more powerful presence in the U.S. market than in Europe, calling the former EMI labels "highly complementary to our existing organization."